When I told my mother that I was going for 4 days to get some time off in the mountains – the only question my mom had was – Whom are you going with? And this was the only answer I didn’t want to give her – Because after asking around a few friends who had valid excuses to not to go..I decided to go alone! But there is something I hate so much about routine, it makes me annoyingly stubborn. I left behind an angry mother who still promised to look after my kids better than I.
I left behind a supremely annoyed husband – who is still trying to find in me the goody good 25 year old girl he married 13 years back. I left behind my father – who winked at me at the house door – implying that I go and explore. I left behind – a sobbing 7 year old daughter who said that she was already missing me. My 4 year old son understood nothing better than hugging me tight. The stop before my destination, Baijnath, is where everybody got off. This is something I hadn’t predicted. There was no way for me to figure out that I was the only one to get down at the last stop. The 15 kms I spent in the bus with the TT and the conductor – I could hear my own heartbeat! I always carry a knife with me and so this was the moment I got it out of my bag and kept it in my hand. I was alone in the bus for 25 minutes! I distracted my mind by making a quick video about how scared I was! It hit me then – that I was now by myself! My courage was truly tested! After my trek, I spent the night at Rajgunda who promised a guest room, bonfire and food for that night! 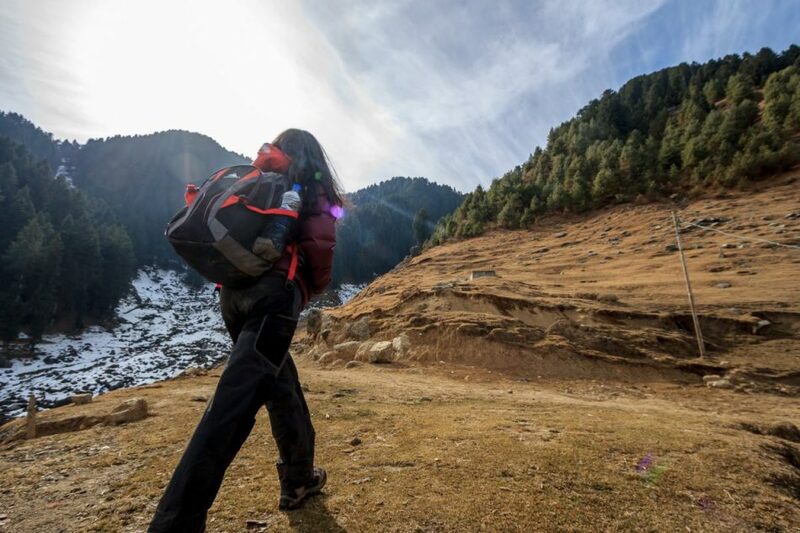 There was no other option and Nupur, the girl from Bir had come along with me for this trek. So we were two women now at the mercy of 3 men who were strangers. I had a whole evening and night to go by in that area – I don’t know why I had visions of ‘the House of wax’ at that time. My phone had no network there. At random moments I had thoughts – Tanya was last seen in Rajgunda! The 3 men turned to be gentlemen and am grateful for a beautiful and peaceful time there. I saw a light color creature running much further ahead while on the trek route. Blame the distance or my overworking mind, it looked like a leopard and I froze for good 5 minutes. Nupur was way ahead of me – and I kept thinking what if he attacked her??? Your scary moments are not always made of being alone. They are also made by people who know you are alone. Before I went out of network for 6 hours, I sent my family a message about the same! After 7 hours when I got network – I saw 36 missed calls from home. The message had never reached them. My heart sank as I thought of my kids. Waking up, walking out and having breakfast without dealing with my kids, my staff and the gazillion things that go wrong in the morning. Taking walks in the fields of Bir – sometimes I walked barefeet, sometimes in my socks. And sometimes I walked on and on and lost my way back. Taking the liberty of changing my plans whenever I wanted. Nobody suffers from my whims. All above are facts! Through this blog I want to create a tiny spark amongst moms and young girls to get out and do something that you are really scared of! If you cant find someone with a similar emotion who is ready to pair up – Then be a Hardass and Go alone! You will end up packing and unpacking for everyone! You’ll put yourself behind the needs of everyone (yes, of course we do it because we love them, but it’s not always fun). A break is “What you decide to do with your time”! For me, it is being free of opinions, compromises, a plan, taking chances, walking down that dark alley and learning to replace fear with curiosity. I mention my kids often in my blogs – sometimes they are the reason for my success, sometimes they are the reason I hold myself back from getting ‘commercial’ success, sometimes I feel I am a better human because of them and sometimes I miss my non-mom persona – I do! Because at one time – when my career, job, education defined my identity, today my kids define a big part of me. It’s when I am constantly trying to be a better parent – Superwoman and Supermom concepts look shallow! The superwoman has the power of flight to escape reality! The supermom creates the false image– has a high profile job, is independent, raises her kids to be geniuses, is a dream wife, lives in a cake house, and is stellar at everything! In reality – we are Juggling and Trying! There are sleepless nights from finishing work early morning and late night, there are tantrums, sometimes I have worn my running gear at 7 in the morning but managed to run at 7 in the evening! There is homework, extra classes, birthday parties and deadlines I have committed to, there are aging parents, a leaking tap that needs a plumber without a wait, a missing help on the most critical day of the week, and then there is a lot to achieve for myself. In reality – I have walked out on crying kids to finish what I have set out for! IT’S IMPOSSIBLE! You end up feeling like a loser! Even though we know how much we are Winning in all this Trying! There are endless trappings of Womanhood, of living the false and unreal images of Supermom and Superwoman! But as you do take this PLUNGE…of being alone, of doing this for the first time, remember to be a mindful woman at every step, use your sixth sense, carry your phone and enough money! Take the Plunge… Be an Adventureress.